Click on the ´Get Deal´ button on the right side of the screen to claim the deal. Copy your referral code. 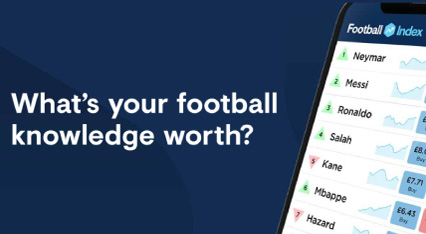 Follow the link to the Football Index website, and you´ll get a £10 bonus if you open an account using your unique referral code. To open a new account, click on the ´Join Now´ button below. In step 1, you´ll need to enter your email address, password and phone number. Choose your country and click ´Next´. In step 2, you´ll need to fill in your personal details and enter your referral code. Read and confirm you accept the Terms of Service. Once you´ve signed up, choose a payment method and deposit amount. To qualify for the £10 bonus offer, you must put down a deposit of at least £10. Football Index is the UK´s gambling platform, known as ´the football stock market´. It was founded in 2015, by Adam Cole. Football Index allows you to buy, trade, and sell football players for real money. You can also earn some dividends. And if you´re not sure whether the trading is for you, you can trade up to £500 risk-free for 7 days.